Travel from Coromandel township, Whangamata, Whitianga and Thames on regular daily bus services to most destinations within New Zealand on New Zealand's largest coach, bus and ferry travel network with InterCity Coachlines. 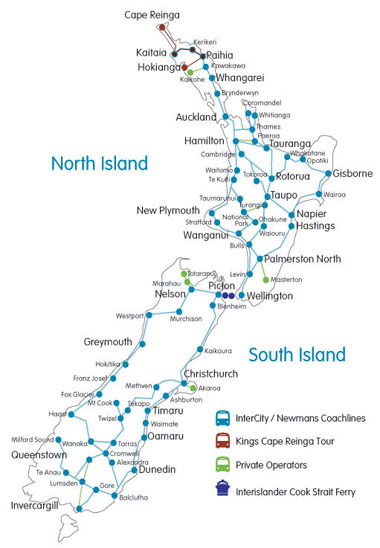 With the national network of InterCity Coachlines, you can travel to more than 500 towns, cities, major ski/snowboarding fields and key tourist destinations nationwide, with over 150 services daily, with a range of affordable fares starting from NZ$1.00. InterCity Coachlines operates a fleet of modern eco-friendly buses and coaches featuring reclining seats with foot and head rests and are fully air conditioned for passenger comfort. InterCity buses and coaches do not have onboard toilet facilities but do stop regularly for refreshment and comfort breaks. InterCity Coachlines operates the Auckland, Hamilton, Rotorua, Taupo, Palmerston North, Wellington Starlighter overnight bus service, that connects with Cook Strait ferry services operating between Wellington in the North Island and Picton in the South Island, with connecting bus and coach services to Christchurch, Blenheim, Kaikoura and Nelson. InterCity Link provides regular bus services to smaller regional centres in association with local bus operators. Using the FareFinder located on the left - you can search online for times, fares, seat availability and make instant confirmation reservations for all InterCity Coachlines bus and coach services through out New Zealand including combined bus and ferry travel between selected destinations in the North Island to selected destinations in the South Islands. All combined bus and ferry fares include bus and ferry travel. When using the 'FareFinder', Newmans Coachlines is identified as 'NM', Great Sights is identified as 'GS', Intercity Coachlines is identified as 'IC' and Intercity Link is identified as 'IL'. With a range of 'Book As You Go' flexi bus and ferry passes, you can travel at your own pace on the InterCity Coachlines national bus and ferry travel network. All Passes are sold in blocks of travel 'Hours' or choose from a range of suggested pre-planned travel itineraries that allows you to travel on regular InterCity regional and long distance bus/coach services and Newmans scenic coach services and/or on any Great Sights scenic coach and sightseeing journeys, in any direction as many times as your hours allow for up to 12 months from date of issue.